I have to admit I’m getting tired of trying to build the perfect turnout. Am I too focused on perfection? I keep looking at the turnouts I build and see something that is not right. I’m currently working on a #9 turnout that relies a lot less on jigs. There were a couple goals I wanted to add to this turnout. Until now I’ve used the Proto:87 Stores Switch-works jig to build my turnouts. But that is problematic, because the heavy duty tie plates I want to use do not fit the jig. 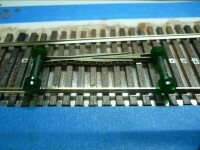 So I build the turnout with medium duty tie plates, them replace them with heavy duty plates before installing rail. Another problem is that I have a #10 jig and want to be able to make multiple size turnouts without having to buy extra jigs.This turnout would be built using a Details West #9 Manganese Frog. 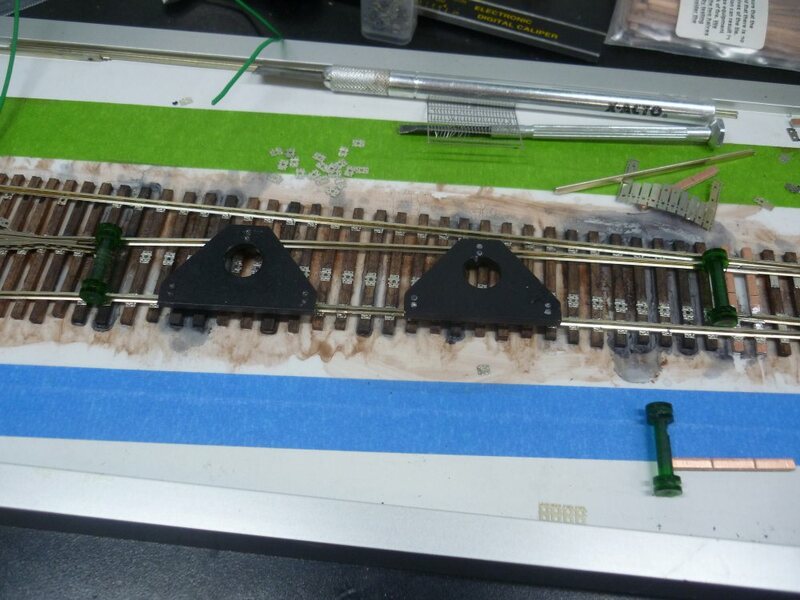 I laid out the ties and the straight rail tie plates using the Switch-Works jig, then sited the frog with track gauges and build the rest with track gauges. It’s a much slower process. My prototype turnouts have very uniform tie plates and spiking; every tie plate is spiked and all of the spikes are on the same size. 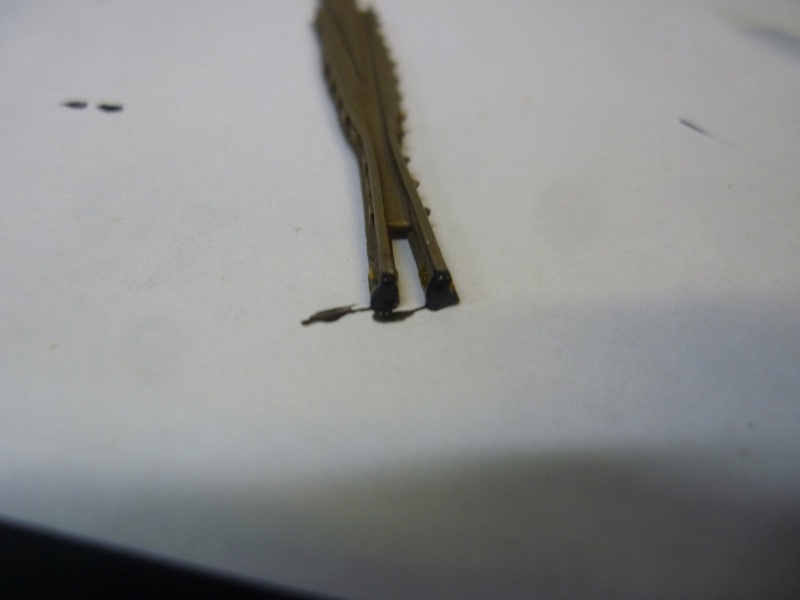 I’ve made an effort to select the correct tie plates so that the spikes all end up uniformly on the same side. Since the Proto:87 Stores tie plates have various hole patterns, selecting the tie plates is a slow and tedious process.Further slowing the process is the necessity to glue tie plates before spiking. If you don’t glue the tie plates, they slide when you spike the rail.Spiking is hard to do uniformly. Getting the correct angle to have a uniform spike head showing has proved to be difficult. 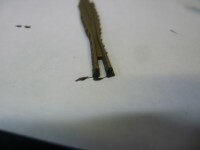 This occurs because spiking pliers (although extremely small) are too large for the spikes. 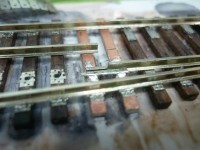 Another factor is the glue hardening and tie plates not being properly aligned. The process has been painstakingly slow. 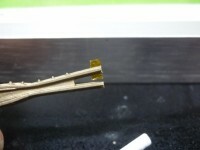 The gauge is great, but the spiking and tie plate uniformity is not perfect. 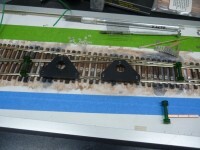 I did have one major breakthrough: locating the points in relation to the sharp curve in the stock rail. I also gave up on the Proto:87 Stores point hinges and decided to use rail joiners soldered to PCB ties as point hinges, and it looks ugly. I’m close to being finished, but I’m still not satisfied. 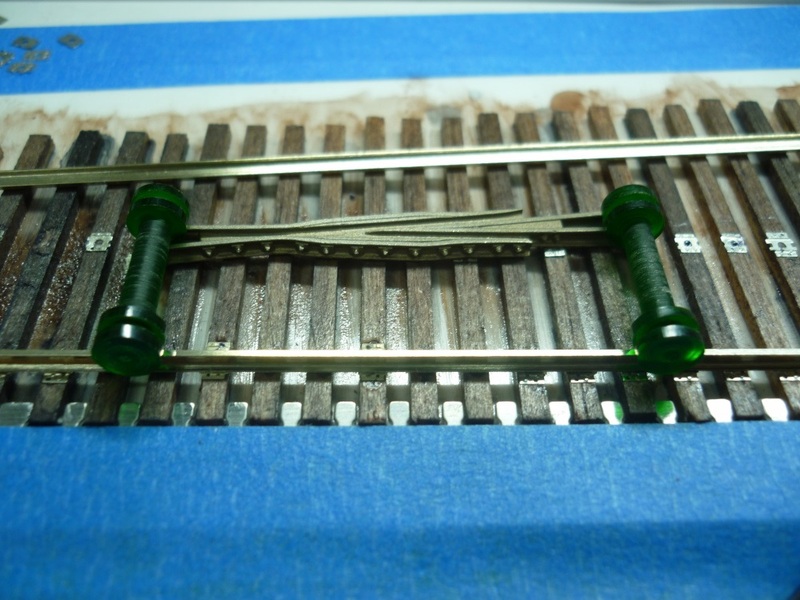 I still need to finish spiking the closure rails, maybe redoing the points, shim the frog to make it Proto:87 and guard rails. 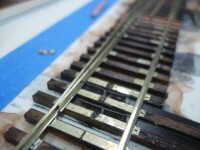 I would like to echo Mike’s comment: it’s really difficult to see the imperfections once the track is painted and ballasted. Cut yourself some slack! First order of business is that the turnouts operate well. Personally, I would compromise almost anything to get that. In Proto:87, the hard part is to get the points close enough to the stock rails that the wheels don’t split the points. Keep it up! Everything so far looks great! I think visually I’m close to where I want to be with the turnouts. I just need to correct a few mistakes, like the ties not being laid perpendicular, and sloppy placement of tie plates. Operationally, I’m not quite there. The throwbar system provided with the Proto87 Stores kits isn’t my favorite solution. I’ve made some of them work by shimming, but you are absolutely right, picking the points is the biggest problem. 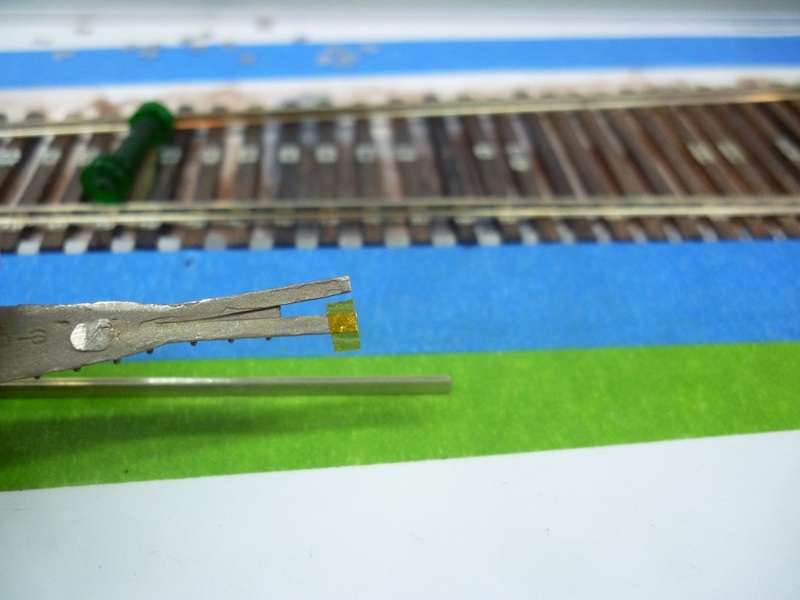 I think maybe I’m on to a new system with Z scale PCB ties bolted to the points tiny with tiny .5mm little bolts and some home made brackets. Last night, I stumbled across your article Throwing a Turnout from Proto:87 Journal #7. Which describes linking a Tortoise to a sort of sub-roadbed turnout, with a pivoting spindle to turn a switch target and I love it. I really want operational switch targets, I was hoping to have hand thrown turnouts also, but I don’t know if that’s going to be possible (and still look good). I’d be happy to lend you my FastTracks stuff if you want to give it a try. I could find your sister in law at the VA.
I’m going to keep plugging away. Quite honestly, I’m close to where I want to be. I tore apart one of my previous attempts today to recycle the parts. Still I appreciate the offer and may take you up on it sometime. 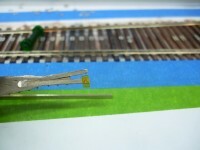 I’m considering moving ahead with modified Peco turnouts, at least that way I’ll have some track to run on. Maybe it’s the optivisor effect, but this turnout doesn’t look as bad in photos as it does under magnification. Still, it’s getting tiring, I only need 5 turnouts. My thinking is it’s such a small number of turnouts, I should be able to go all out and make something close to exactly what I want. Problem is I’ve made 5 turnouts and all of them have flaws & only one looks great and works well. I tend to agree with Toni. It sounds like you aren’t really enjoying the process, and that is going to make attaining these goals very difficult. Maybe you need to step back and think about whether to continue or find something else you don’t find as frustrating, at least until you feel like going back to this. It’s a moving target isn’t? Have you painted weathered or ballasted one of them yet? 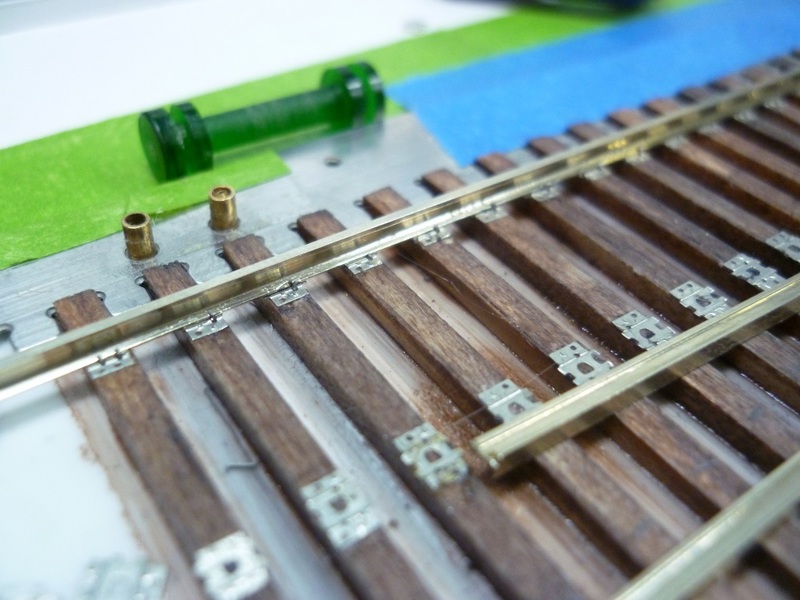 It makes a difference in how you see the finished track work. I feel your pain! At some point you have to say it’s “good enough”, and get on with the parts of the hobby you really enjoy. 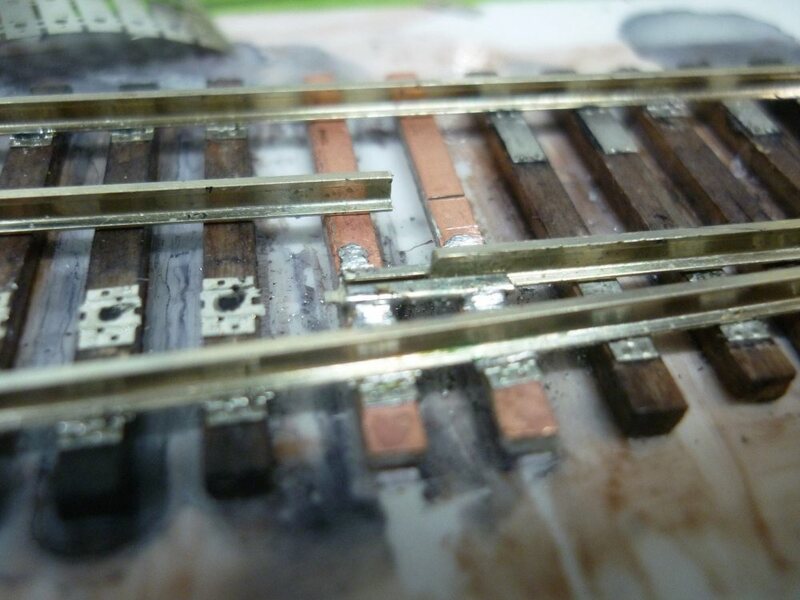 I am curious if you are intending to have your whole layout done with these super detailed turnouts? Not that I want to discourage you from trying to get the look you want either, but sometimes taking a break and working on something else will let the problems “percolate” and you’ll come up with that “AHA!” idea that makes it all fall into place. They look pretty good to me, especially considering how many fiddly pieces you are trying to wrangle into place! Strive for perfection, settle on exceptional.